Entry is £6 for members of affiliated clubs or £8 if unaffiliated. There is a supplement of £2 for entry on the day. or by post using Entry Form. Entries on the day will be accepted at the Race HQ until 10:00am or when we reach our limit. Previous years results at the bottom of this page. The Switchback 5 is one of the highlights of our club calendar. 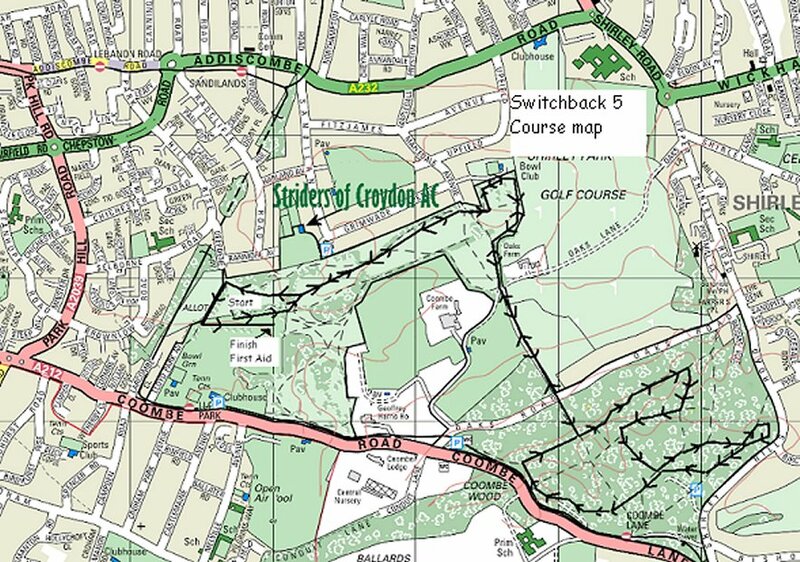 The course is a 5 mile, single lap, off road route around Lloyd Park and into Addington Hills. It’s a popular warm-up to the cross country for club runners, but is also ideal for runners of all abilities looking to step up from a local 5km parkrun or Race for Life. The Switchback 5 represents great value for money, with entry fees this year at £6 attached and £8 unattached for entries before the day – £2 extra for entries on the day. All finishers receive a FREE memento and this year they’ll also be able to enjoy FREE tea and cake at our Sandilands clubhouse after the race. Prizes will be awarded to the winners of the men’s and women’s races, with trophies for places, teams (3 to score) and the winners of male V40, V50 and V60 and female V35, V45 and V55 categories. The start of the race is in Lloyd Park, a couple of minutes jog from the Race HQ at Sandilands clubhouse, Addiscombe, Croydon, CR0 5DB. Lloyd Park and Sandilands are on the Croydon Tramlink network, a couple of stops from East Croydon mainline station. The start and finish in Lloyd Park and the viewing platform in Addington Hills are good places to spectate. NOTE: NO NUMBERS WILL BE MAILED OUT. PLEASE PICK NUMBER UP ON THE DAY FROM OUR SANDILANDS CLUBHOUSE (CR0 5DB) – 5 MINS JOG FROM START. From East Croydon Station take any east bound tram or a 119,194,198,466 bus to Sandilands Tram Stop.